A US Air Force HH-60G Pave Hawk helicopter has crashed just after 7 pm last night during a routine training exercise in a nature reserve in Cley-next-the-Sea (Norfolk) popular with bird-watchers. Police has confirmed that all four crew members have died in the collision. 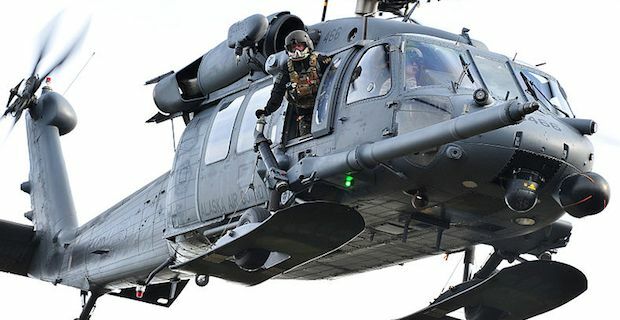 The Pave Hawk, based at Lakenheath Royal Air Force station in Suffolk, was carrying a substantial amount of ammunitions, which are now scattered around the aircraft wreckage over an area described by Police as "the size of a football pitch, with difficult terrain". The crash site has been cordoned off and the the A149 through Cley is currently closed. The debris located closest to the coastline, including live bullets, have already been cleared up as Emergency Services are trying to avoid them being dragged away by the high tide. The cause of the crash is still unclear and an initial inquiry is currently being carried out by the police coroner. The investigation will be soon handed over to the British Air Accidents Investigation Branch and Ministry of Defence who, together with US Air Force, will try to establish what happened.